When Audra Skuodas was three years old and still living in Lithuania, she would draw pictures of Joseph Stalin and throw things at it. serious car accidents during her youth. And while she also lost years of extensive musical training, her ability to make sense of a cruel and complicated world has not been forgotten. And over the years she has honed that skill as a base for her art. Skuodas uses visual art to express things that many people have trouble verbalizing. When she saw a Time magazine photo of a little girl who was mutilated in the 1994 Rwandan genocide, Skuodas burst out sobbing. She was moved to do a painting to express her anguish at the human capacity for cruelty. When she finished, the painting wasn’t one of violence. It had transcended violence to arrive at pathos, her husband, John Pearson (cap 1975), told her. 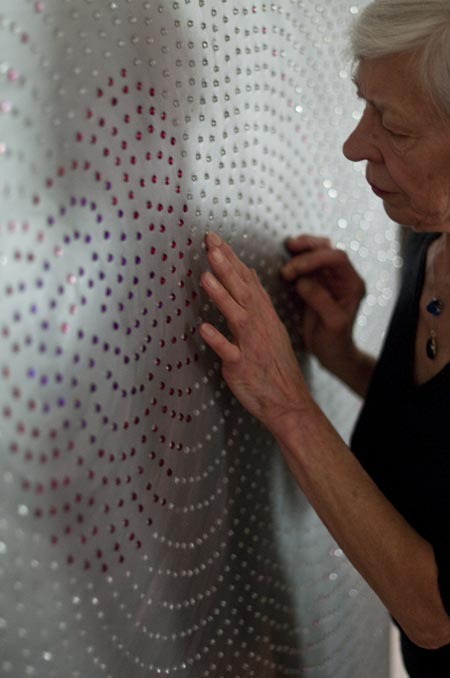 Her 4-year body of work includes wall sculpture, bookmaking, drawing and writing. She focuses on sets of problems, such as yin and yang, spiritual and material, soul and body, good and evil. Her color choices veer toward pink and blue with red acting as a counterpoint. The art is about vulnerability, she says. This unusual palette gave rise to many debates with her college professors. Her daughter’s involvement with dance inspired Skuodas to see the human body’s capacity to abstract space and communicate emotion, as she describes it. The figures evolved into angular, sometimes impossible positions, to express those emotions. The walls of her studio in Oberlin are covered with paintings and the tables are stacked with books she has made. Her home above the studio is brilliantly colored with art-covered walls and decorated with traditional Mexican pieces collected in New Mexico and flea-market kitsch acquired over the years. She is relatively reclusive, although a conversation with her is intriguing, funny and touching. And while she feels her lack of self promotion is a handicap, she also embraces it as part of her artistic being. She says her art is the product of her private world, philosophical explorations and her experience of motherhood. A reluctant mother, she feared that taking care of her family would be a sacrifice. Instead, she says, it turned out to be her greatest gift and the most profound philosophical lesson. Her children tell her that she raised them to listen to their hearts—even though it doesn’t always make life easy.